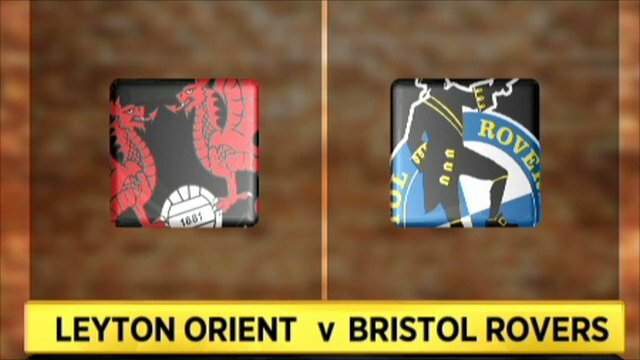 Leyton Orient extended their impressive home record at the expense of struggling Bristol Rovers. Jimmy Smith powerfully headed the O's in front from Dean Cox's cross before Andy Whing fired in from 25 yards. Rovers were handed a lifeline when Jason Crowe turned Jeff Hughes' cross into his own net, but Harry Kane finished smartly to make it 3-1. Kane then headed home from a Charlie Daniels cross to extend the host's unbeaten home run to 14 games. "It was a fantastic result but it was a really, really tough game. "It was only in the latter part that we got the goals, but it was a good display and a good victory for us. "The substitutions were made at the right time when Harry Kane came on." 90:00+2:19 The referee blows his whistle to end the game. 90:00+0:31 Alex Revell takes a shot. Luke Daniels makes a save. 89:57 Handball decision goes against Paul-Jose M'Poku. Luke Daniels restarts play with the free kick. 88:44 Jason Crowe has an effort at goal from outside the penalty box missing to the wide right of the goal. 87:49 Charlie Daniels has an effort at goal from outside the area missing to the wide right of the goal. 87:05 Harry Kane fouled by Danny Coles, the ref awards a free kick. Stephen Dawson restarts play with the free kick. 82:58 Substitution Jimmy Smith leaves the field to be replaced by Thomas Carroll. 82:58 Substitution Paul-Jose M'Poku joins the action as a substitute, replacing Dean Cox. 81:37 Assist on the goal came from Charlie Daniels. 81:37 GOAL - Harry Kane:Leyton Orient 4 - 1 Bristol Rovers A goal is scored by Harry Kane from inside the six-yard box to the bottom right corner of the goal. Leyton Orient 4-1 Bristol Rovers. Correction - 80:07 Unfair challenge on Stephen Dawson by JP Kalala results in a free kick. Indirect free kick taken by Jamie Jones. Correction - 80:07 Substitution (Bristol Rovers) makes a substitution, with Jo Kuffour coming on for Gavin Williams. 80:07 JP Kalala challenges Stephen Dawson unfairly and gives away a free kick. Jamie Jones takes the indirect free kick. 80:07 Substitution Gavin Williams goes off and Jo Kuffour comes on. 80:07 Booking JP Kalala goes into the referee's book. 78:47 The ball is swung over by JP Kalala, clearance by Alex Revell. 78:19 The referee penalises Dean Cox for handball. Gavin Williams takes the free kick. 77:44 Jason Crowe concedes a free kick for a foul on Gavin Williams. Gavin Williams takes the indirect free kick. 76:40 The assist for the goal came from Charlie Daniels. 76:40 GOAL - Harry Kane:Leyton Orient 3 - 1 Bristol Rovers Harry Kane gets on the score sheet with a goal from deep inside the penalty box to the bottom left corner of the goal. Leyton Orient 3-1 Bristol Rovers. 75:49 Will Hoskins crosses the ball, clearance made by Terrell Forbes. Shot from outside the penalty box by Ben Swallow goes wide right of the goal. 74:52 Outswinging corner taken by Gavin Williams from the right by-line, clearance by Alex Revell. Corner taken right-footed by Gavin Williams from the left by-line, Jamie Jones makes a save. 74:14 Alex Revell crosses the ball, Byron Anthony makes a clearance. 71:26 Shot from inside the six-yard box by Will Hoskins goes wide right of the target. 69:50 Substitution Scott McGleish goes off and Harry Kane comes on. 62:38 Corner taken by Gavin Williams from the left by-line to the near post. 61:43 Effort from outside the penalty box by Charlie Daniels goes wide left of the goal. 59:05 Substitution Ben Swallow comes on in place of Scott Davies. 58:52 Scott McGleish sends in a cross, clearance by Byron Anthony. 57:36 Inswinging corner taken by Charlie Daniels from the right by-line. 57:27 Jimmy Smith crosses the ball, clearance by Jeff Hughes. 56:58 Centre by Dean Cox, Gary Sawyer makes a clearance. 55:58 Jimmy Smith is flagged offside by the assistant referee. Free kick taken by Luke Daniels. 51:56 A cross is delivered by Scott Davies. 51:56 GOAL - Ben Chorley:Leyton Orient 2 - 1 Bristol Rovers Ben Chorley heads into his own net. Leyton Orient 2-1 Bristol Rovers. 49:55 Alex Revell takes a shot. Save by Luke Daniels. Corner taken by Gavin Williams, Alex Revell manages to make a clearance. 49:14 Dean Cox produces a left-footed shot from just outside the box that goes wide left of the target. 48:39 Corner from right by-line taken by Charlie Daniels. 48:30 The ball is swung over by Alex Revell, James Tunnicliffe makes a clearance. 45:00+3:13 The ref blows to signal half-time. 45:00+1:37 Gavin Williams takes a inswinging corner to the near post, clearance made by Jimmy Smith. 45:00+0:51 Jeff Hughes takes a shot. Save by Jamie Jones. 44:31 Unfair challenge on Alex Revell by Danny Coles results in a free kick. Indirect free kick taken by Ben Chorley. 42:16 Alex Revell takes a shot. Luke Daniels makes a save. Inswinging corner taken by Dean Cox, clearance by Danny Coles. 41:16 Long distance effort on goal by JP Kalala goes wide left of the target. 38:48 Dean Cox takes the inswinging corner, Byron Anthony manages to make a clearance. 38:27 Centre by Charlie Daniels, clearance made by James Tunnicliffe. 36:57 Foul by Byron Anthony on Stephen Dawson, free kick awarded. Dean Cox restarts play with the free kick. 35:36 Free kick awarded for a foul by JP Kalala on Stephen Dawson. Ben Chorley restarts play with the free kick. 34:54 The ball is swung over by Gary Sawyer, clearance by Stephen Dawson. 33:53 The ball is sent over by Dean Cox, Danny Coles manages to make a clearance. Correction - 31:32 Jason Crowe challenges Jeff Hughes unfairly and gives away a free kick. Gavin Williams restarts play with the free kick. 31:32 Free kick awarded for a foul by Jason Crowe on Jeff Hughes. Gavin Williams takes the indirect free kick. 29:46 Centre by Dean Cox. 28:24 Shot from just outside the box by Gavin Williams goes over the bar. 26:54 The assistant referee flags for offside against Alex Revell. Luke Daniels takes the indirect free kick. 25:58 Scott Davies has an effort at goal from outside the area which goes wide left of the target. 25:22 Dean Cox delivers the ball, clearance by Danny Coles. 24:52 The ball is sent over by Rene Howe, Andrew Whing makes a clearance. 21:34 Scott Davies takes a shot. Save by Jamie Jones. Will Hoskins is caught offside. Jamie Jones takes the indirect free kick. 18:51 The ball is delivered by Dean Cox, Close range header by Alex Revell goes over the bar. 17:43 Effort on goal by JP Kalala from outside the box goes harmlessly over the bar. 17:09 Free kick awarded for a foul by Dean Cox on Will Hoskins. The free kick is swung in right-footed by Gavin Williams, clearance by Rene Howe. 15:32 The assist for the goal came from Dean Cox. 15:32 GOAL - Andrew Whing:Leyton Orient 2 - 0 Bristol Rovers Andrew Whing scores a goal from just outside the box to the bottom left corner of the goal. Leyton Orient 2-0 Bristol Rovers. 14:45 A cross is delivered by Rene Howe. Correction - 13:11 The ball is swung over by Gary Sawyer, Scott McGleish manages to make a clearance. 13:11 A cross is delivered by Gary Sawyer, clearance by Scott McGleish. 12:26 Inswinging corner taken by Gavin Williams from the left by-line played to the near post, clearance made by Jimmy Smith. 9:25 The official flags Scott McGleish offside. Free kick taken by Luke Daniels. 7:59 Outswinging corner taken right-footed by Gavin Williams, Header from deep inside the penalty area by Rene Howe goes harmlessly over the crossbar. 7:17 Stephen Dawson concedes a free kick for a foul on Gavin Williams. Gavin Williams restarts play with the free kick. 6:44 The ball is delivered by Gary Sawyer, Charlie Daniels manages to make a clearance. 6:06 Ben Chorley is ruled offside. Luke Daniels restarts play with the free kick. 4:44 Dean Cox produces a cross, Jimmy Smith takes a shot. Dean Cox provided the assist for the goal. 4:44 GOAL - Jimmy Smith:Leyton Orient 1 - 0 Bristol Rovers Jimmy Smith finds the net with a headed goal from inside the six-yard box. Leyton Orient 1-0 Bristol Rovers. 1:18 Scott Davies has an effort at goal from the edge of the area that misses to the right of the target. 0:53 Corner taken right-footed by Gavin Williams to the near post, Jimmy Smith makes a clearance.